No, not me, although I did actually craft a little gift for a friend over the weekend, and need to get to crafting some other gifts tonight. My friend Jena, made Emmie the most amazing hats. Here’s Emmie in her ladybug hat (since Jena is very astute and noticed that we have a ton of ladybug things for Emmie: outfits, Halloween costumes, diapers, etc.). 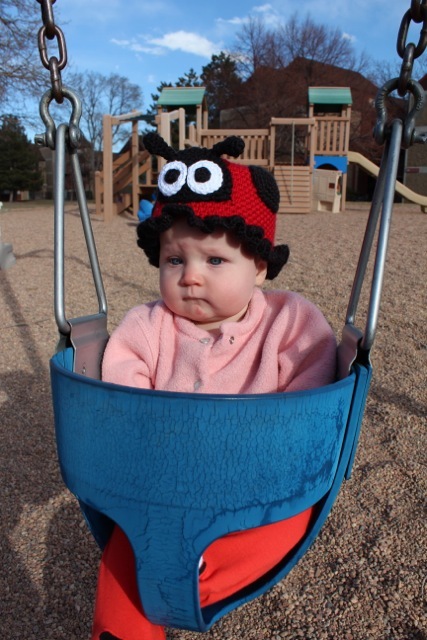 This hat even looks like an adorable ladybug when you take it off and put it on the ground. So cute! 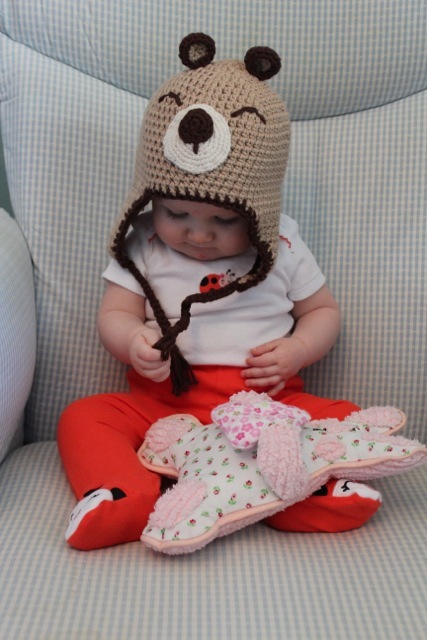 She also made this adorable bear hat (shown here in an outtake from this week’s weekly photo, to be uploaded soon!). Emmie loves it because it has delicious strings to chew on. I love it because the flaps protect Emmie’s delicious cheeks (while looking adorable). Every time Emmie has worn either of these, people always comment on how cute they are and then immediately ask if Jena sells these. (No, at least, not yet). The astounding thing to me is that Jena MADE THESE PATTERNS UP. Seriously. And they are better than pretty much everything I’ve seen in my Googling of crocheted baby animal hats. I am so lucky to have such talented friends!